Too many new medical devices reach the market without extensive testing or review. Read our newsletter this month to learn more about this important issue and ways you can protect yourself and your family from defective medical devices. Welcome to our Newest Attorney, Emily Ballenberger! The staff at Olsman, Mueller, Wallace & MacKenzie is pleased to announce the addition of Emily Ballenberger to the firm. 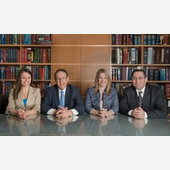 Ms. Ballenberger comes to us with many years of experience as a litigator and counselor, and has a well-earned reputation as a zealous client advocate. She will be a tremendous asset to our team. Welcome, Emily! 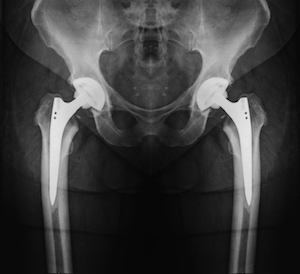 Arthroplasty, the reconstruction or replacement of a joint, as shown here in this hip x-ray, is big business for aging baby boomers. The size of the United States medical device market is expected to surpass $133 billion by 2016. At $110 billion, it is currently the largest medical device market in the world. A 2011 study found that 71 percent of Class I medical device recalls (those deemed most likely to cause serious adverse outcomes or death) were cleared through the FDA’s 510(k) fast-track approval process. According to a recent FDA report, recalls of defective medical devices nearly doubled from 2003 through 2012: 1,190 in 2012 compared with 604 in 2003. Many surgeons use a device called a morcellator as a way to do noninvasive hysterectomy surgery. Amy Reed, a doctor herself, says the morcellator used in her 2013 hysterectomy spread cancer all over her stomach. View video. A recent study from the Wall Street Journal shows the majority of moderate- to high-risk medical devices approved by the FDA lack scientific evidence to verify safety and effectiveness with patients. View video. Experts say the FDA has known since at least 2009 that the medical devices involved in a superbug outbreak that infected 179 patients in Los Angeles could transmit lethal infections but did not require more stringent safety standards. View video. Backed by experts and advocates at Consumer Reports, SafePatientProject.org provides a forum for people to speak out about medical harm.